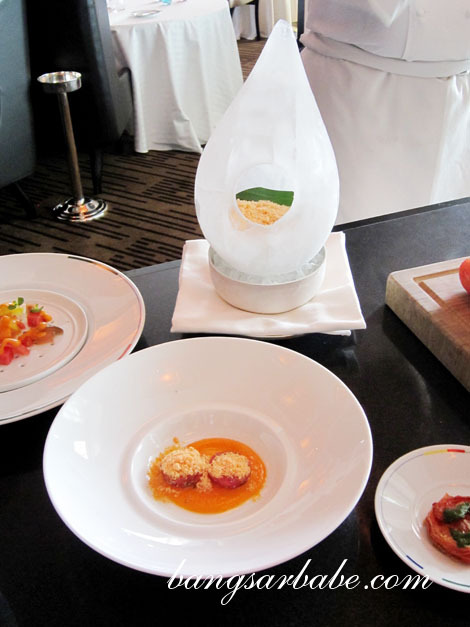 During my stay at Marina Bay Sands, I was also given a sneak preview of Waku Ghin, which means Silver Metal. 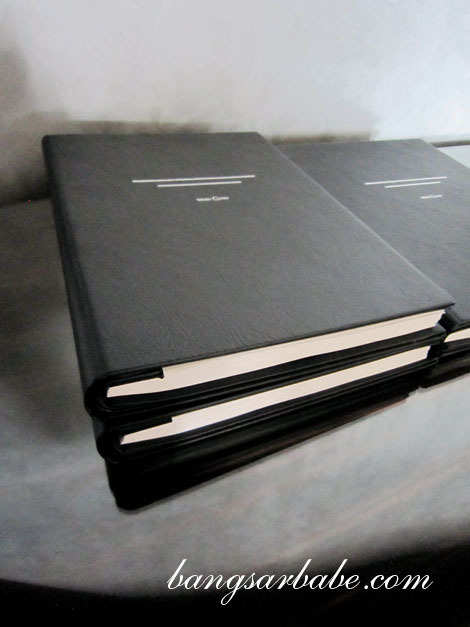 I was told Waku Ghin isn’t a replica of Tetsuya’s Sydney – it only has one menu; the 10-course omakase. This is the drinks menu. So thick, with a mind-boggling selection! 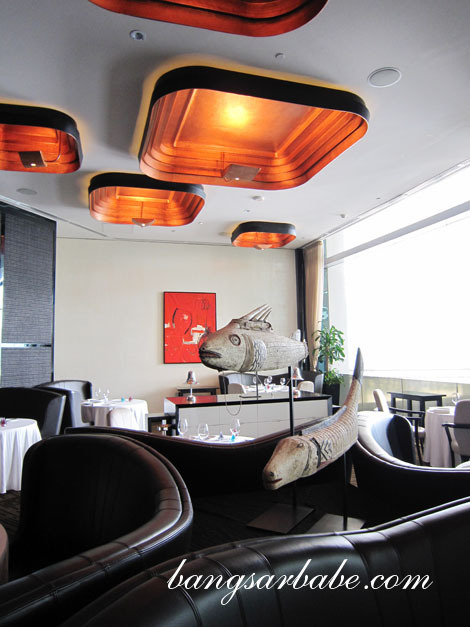 Diners begin at the sake lounge, then to a teppanyaki room and lastly, the main dining room which boasts a floor-to-ceiling view of the skyline. 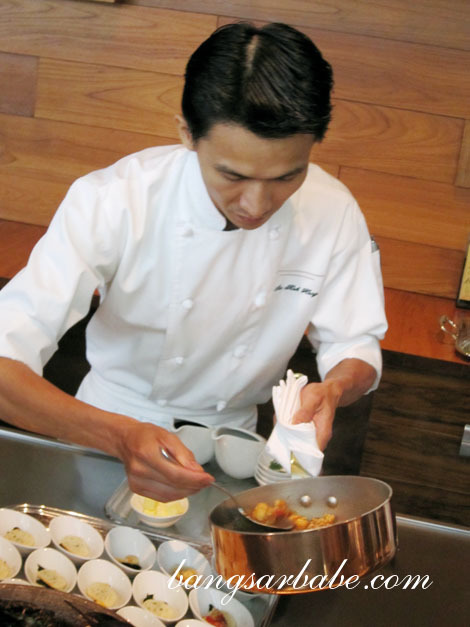 The chef de Partie is a favourite of Chef Tetsuya and he’s a Malaysian – Chef Sia Kok Hong. 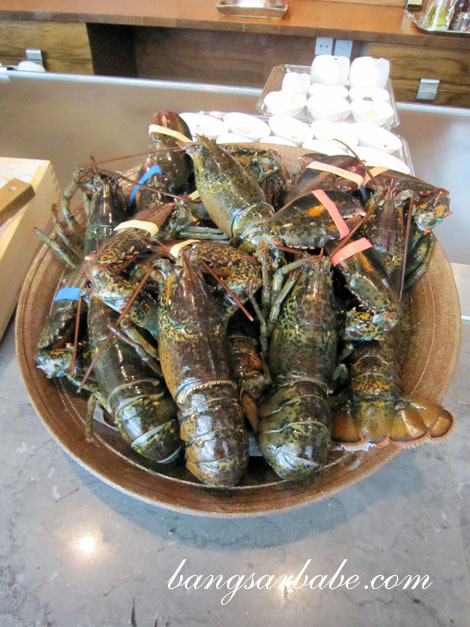 He coolly demonstrated to us, how to prepare the Braised Canadian Lobster. Wasabi. That’s shark skin on the wooden board. 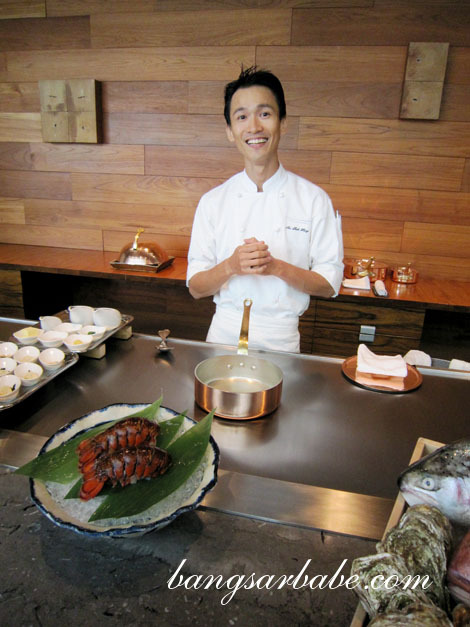 The cooking at Waku Ghin is Japanese, with a strong influence of French technique. 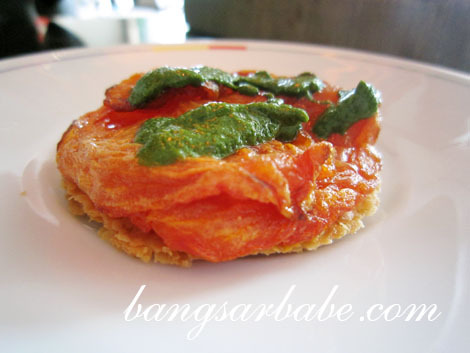 Chef Sia left no trail of mess behind when he prepared this dish. 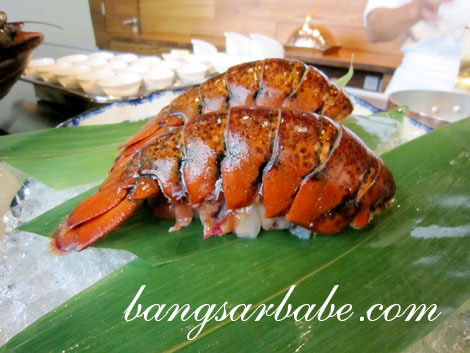 The lobster was lightly cooked so it had a perfect, succulent texture. 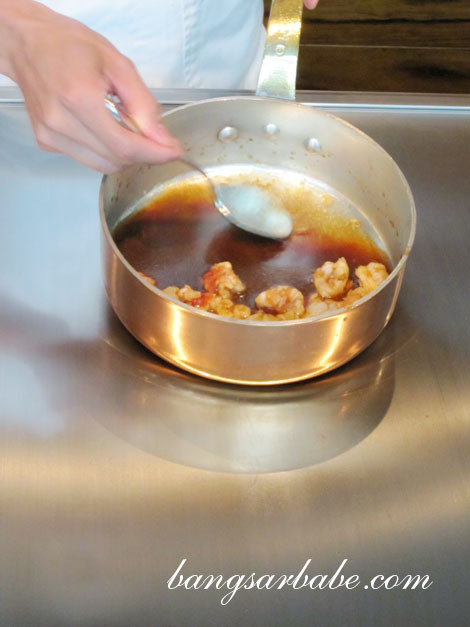 I liked the broth, made with seafood, olive oil, tarragon and some butter. Next, we moved on the Guy Savoy, an award winning restaurant in Paris and one of the finest haute cuisine establishments in the world. The restaurant seats up to 80 pax with two private rooms. Love the tribal fish display at the centre. 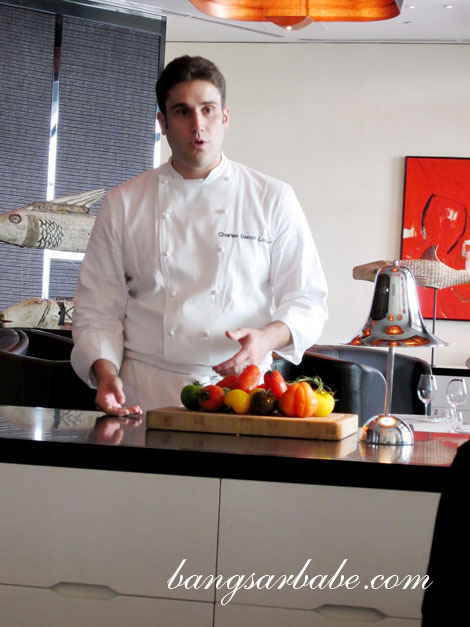 Chef Charles-Benoit Lacour prepared an entrée of assorted tomatoes that was colourful and delicious tasting. 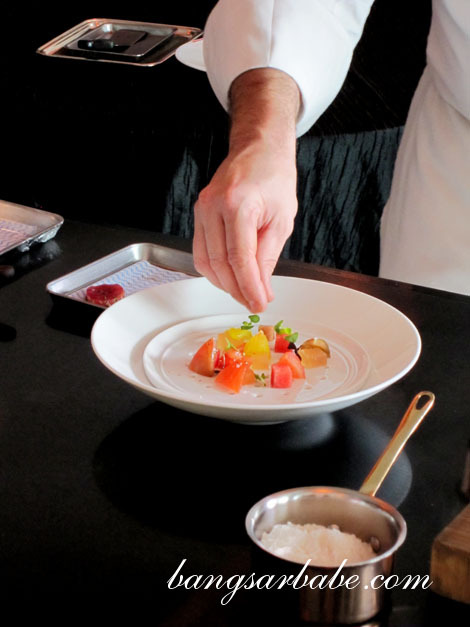 This dish was far from simple – served in three tiers comprising Heirloom Tomato Facon Tartare, Seeds and Leaves, Tomato Tarte and Granita. 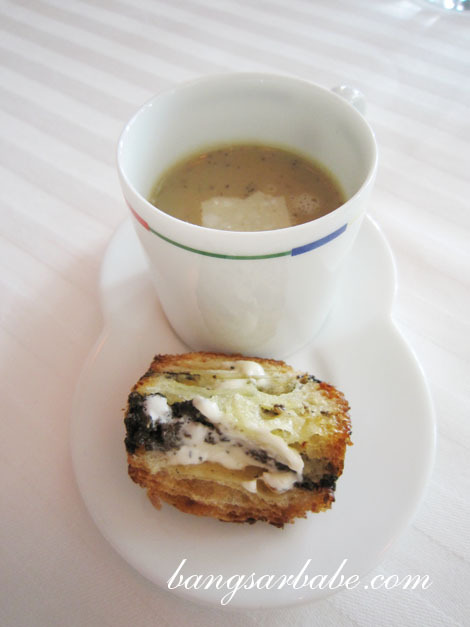 I sampled Guy Savoy’s signature soup – Artichoke and Black Truffle Soup with Brioche – and was temporarily lost for words. Just lovely. 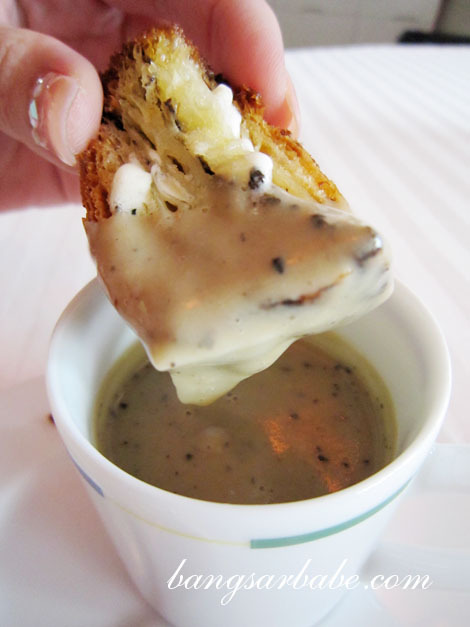 The truffle-infused soup boasted a buttery finish. And don’t get me started on the black-truffle brioche at the side. If you’re interested, the ala carte version cost S$70. 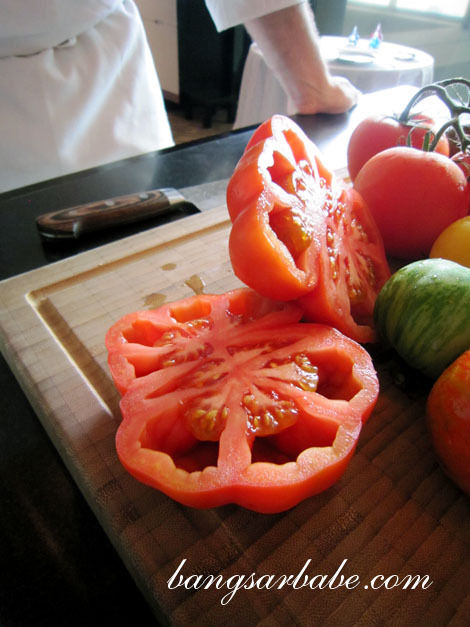 Both of these restaurants are on my wish list… heirloom tomatoes are so full of flavour, right?